Sir Elton John knows how to write a good song. There was a poll aired recently on TV rating his best songs. I must admit I didn’t watch it or know which one won but if you ask me I would go for “Don’t let the sun go down on me”. The live duet with George Michael on Live Aid in 1985 brings me out in goosebumps every time. But I digress. I chose these lyrics as my opening quote as they sum up two subjects that are monopolising my life at the moment. So once again I’m taking the plunge into high street retailing. The Church Park Flowers pop up shop is back. Now in its third year, an empty unit in Butcher Row, Barnstaple becomes my home for four weeks. I never know what is going to be available, I only get 2 weeks notice of an agreement between myself and the council to have a temporary licence to sell natural Christmas goods to the masses of North Devon. I guess being my third year means it’s not such a leap of faith as it has been. But that little voice of doubt always sits on my shoulder whispering; will people find me, will people buy my wreaths and decorations for their homes, is it the right decision. Put my positive hat on and it’s a different story. Butchers Row is a great place to be. Full of independent businesses. Some new this year, others been there for yonks. It’s a very friendly place to be. I love being somewhere I can meet the public. Working mostly from home in a workshop in the garden can be pretty lonely at at times - so an opportunity where people can pop in just for a chat - and hopefully spend some money - is very welcome in the winter months. And of course it’s Christmas. I love Christmas. My little pop up shop is a tiny slice of a natural rustic Christmas. Twinkling lights and (unlit) candles. Pretty sparkly ribbons galore. And the scent - well where do I start: pine, eucalyptus, cimamon, orange slices. It’s potpourri on a massive scale! The best seller of this pop up enterprise? The natural Christmas wreath. It's circular shape represents eternity, for it has no beginning and no end. From a christian religious perspective, it represents an unending circle of life. The evergreen, most frequently used in making wreathes, symbolizes growth and everlasting life. Holly, ivy, spruce are all good winter growing evergreens. Add some eucalyptus and rosemary for scent and you have a pure “green” wreath. Fresh for the festive season, all British grown, but of course fully biodegradable afterwards. See, the circle of life manifests itself again! 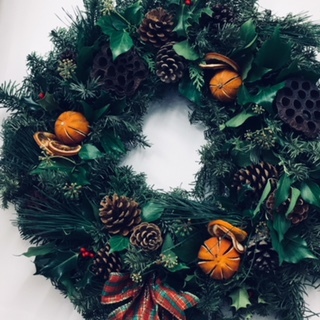 A selection of wreaths in different sizes and styles will be available to buy at the Butcher Row shop. Or order something bespoke. Come say “hi”, came have a nose and have yourself a natural little Christmas. Posted on November 25, 2017 by Heather Eales and filed under Christmas, Workshops and tagged Christmas wreaths rustic popup shop natural.